Campaign to fund the $400,000 stadium for University of Nebraska-Lincoln was launched in 1922 and proved successful enough for the 31,000-capacity ground to be ready by October 1923. Back then it had two grandstands in the west and east (current lower tiers of the stadium’s both sides). It survived in this shape and size until mid-1960’s when the new south stand was erected. Later expanded, the single-tiered section is distinctive due to its unusual shape. Instead of curved or more rectangular layout, various sections of the stand are angled differently towards the field. By the end of that decade, similar sections were added in the north, making the capacity nearly 65,000. Until late 1990s the stadium had nearly only general admission seats. This changed when new pressbox was erected in the west, accompanied by vast corporate zones with skyboxes and open-air sections. In 2012-2013 similar expansion was carried out in the east, setting regular capacity at 85,000. Record attendances are way higher than the nominal size, though. Since 2013 top games were watched by 91,000+ and the stadium boasts the NCAA’s record for over 340 sellouts in a row! The name Memorial Stadium was initially dedicated to Nebraskans who fought in the Civil War and American-Spanish War, later also to those giving their lives in further wars. Sport arrived to former Camp Randall military training camp just three decades after the Civil War, making it one of the oldest operating sports fields in the USA. That said, it wasn’t the current stadium, fans would gather mostly on wooden benches and stands. These began dilapidating after two decades and in 1915 parts collapsed, prompting financial aid for complete reconstruction. After several months of works, the stadium for just over 10,000 people was opened, but soon proved insufficient. Already by 1920 it was expanded to 20,000, after a few more years it was nearly 40,000! 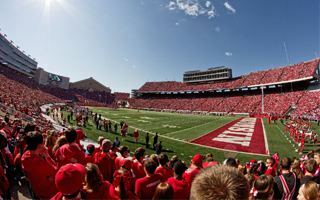 This immense growth was associated with demand for Badgers games and the Big Ten’s team potential. Initially shaped as a horseshoe with open south end, the stadium became nearly fully enclosed by 2005 to cope with the demand. The running track had to be removed, south end occupied (though still topped by the 1930 Field House) and west side received as big upper deck as was possible to fit with a road running just behind the stand. With over 80,000 capacity now, the stadium offers bulk of its great corporate seating in the east, while the northern curve is devoted to the so-called student section. It’s known globally to begin jumping after the third quarter in the tune of “Jump around”, getting almost all of the stadium in a festive mood. Opened after just 7 months of around-the-clock work in 1929, this stadium in western Iowa City was then called simply Iowa Stadium. Owned by University of Iowa was indeed pride of the state as it had two vast grandstands (partly sunken, partly built with concrete and steel) with capacity of 25,000+ each. No major changes were carried out until 1956, 1983 and 1990, when additions of new sections behind northern and southern goals allowed it to exceed 70,000, the capacity it has today. To date the greatest renovation came in 2004-2006, when nearly $90 million was invested to reconstruct the entire south end and add a new press/VIP tower in the west. The stadium’s name changed in 1972 to honour Nile Kinnick. He was a rising star of American football in 1939, when the WWII forced him to join the army. He was killed during a training flight near the coast of Venezuela.